It’s never too late to get started on social media for your business! As time goes by and social media platforms change, the profile build process evolves, too. 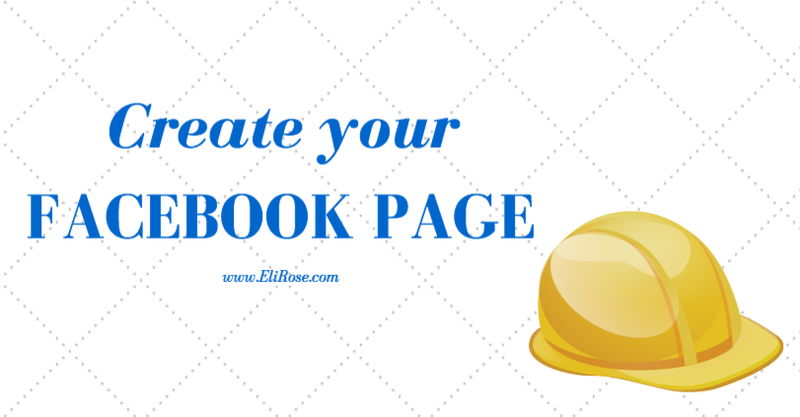 Here’s what you need to know if you are creating a new Facebook fan page in late 2015. Begin by visitingÂ https://www.facebook.com/pages/create. Next,Â choose your page type. Don’t stress too much about this; all Facebook pages have the same look and functionality. The page type is mostly about how you categorize your business (more on this below) and whether or not you need to include a physical address for your business location. 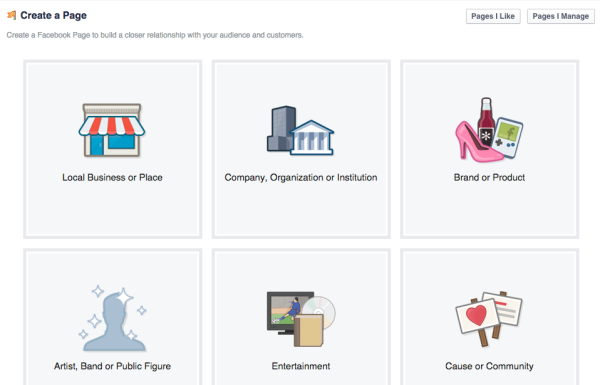 You’ll want to select Local Business or Place if you want to include your physical address on your page and give people the ability to check-in on Facebook when they visit your business. 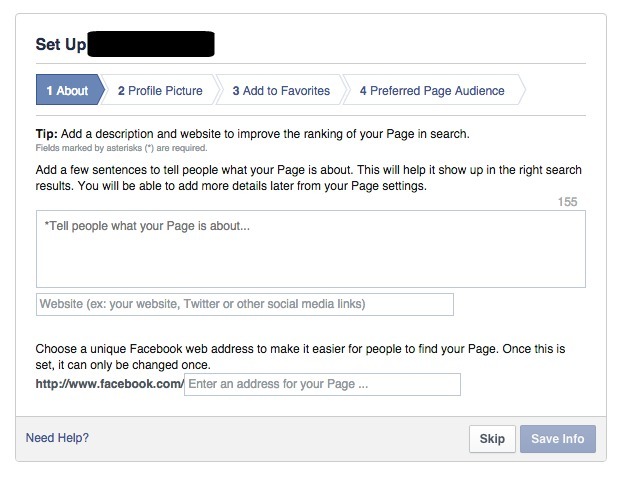 Once you’ve clicked on your desired page type, you’ll be asked to choose your category and enter your page name. 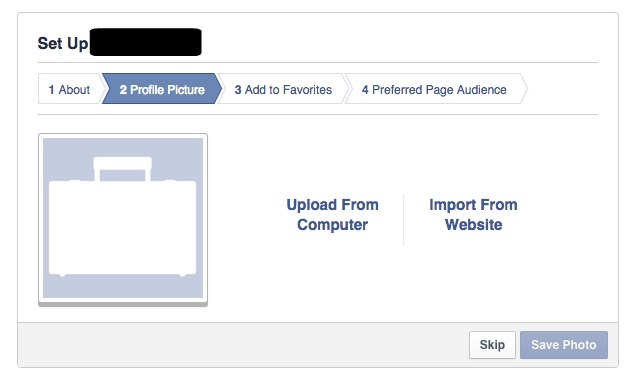 The page name is what is displayed in large white letters, to the right of your profile picture on your Facebook page. If you select a page type, review the category list, and feel perhaps a different page type could suit you better, simply click on it instead. Once you’ve settled on the page type and entered your page name, click the blue Get StartedÂ button. 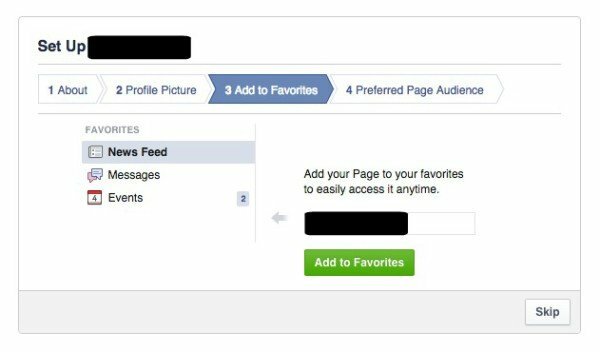 On the next screen, you’ll enter text that will be used as your About section and your website address, and choose your Facebook URL. 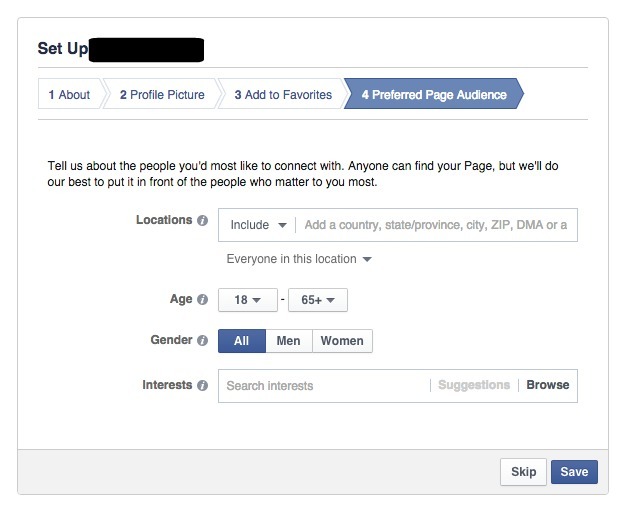 Previously called your Facebook Vanity URL, this is the direct address to find your business on Facebook. Â It’s very important to set this. Without it, you’ll have a long, impossible to remember URL and your page will be extremely difficult to find in search and tag in updates. Upload your profile photo. This can be changed and cropped once your page is created, too. You can choose to add your new Facebook page to your Favorites so you can easily find it in the left sidebar of Facebook.com when on desktop. You can skip this, too. You can also add or remove pages from your Favorites at any time. Your Facebook page is live on the internet at this point. Once you get everything filled out like you want, you are ready for prime time! You can post content, invite your friends and run Facebook ads.